The MusicStack website tried to put together a list of the ten most valuable vinyl records. They used different sources to come up with the list (Ebay, RecordCollector and others). 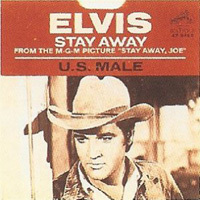 Elvis is mentioned 1 time on the 8th place with Stay Away, Joe (US, RCA Victor UNRM-9408, 1967), a one sided promo release, sold for $25,000. How about my single, Europe- the final countdown?.. Why show a picture of Us Male / Stay Away? Hmm...Although entitled Stay Away Joe, and was loosely intended to promote the film, the LP was a mix of cuts from His Hand In Mine and How Great Thou Art and was produced for a radio station in Arizona - where the film was made. Another slice of the bizarre from Parker...I believe he owned this record and it became part of his estate inventory. I remember that there was a white vinyl lp of Moody Blue that was at a high price what happen to that one?